Moorhead Community Access Media and TV (MCAM) is the non-profit cable access television stations for Moorhead, MN. MCAM programs two channels, the government channel and public access channel. The government channel broadcasts Moorhead city meetings live as well as Clay County meetings recorded and other pertinent city and county meetings as well as rebroadcasting the Minnesota Legislature and Twin Cities Public channel during the 8am-4pm business weekday. MCAM's Moorhead Access Channel broadcasts a wide range of public interest programming, musical programs, arts and information programs as well as classic public-domain films and tv shows. 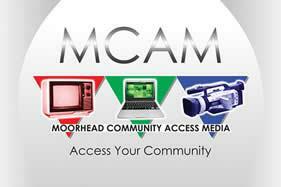 MCAM exists to give access to the Moorhead community and also conducts training in media production. MCAM is a 501(c)3 non-profit organization.